The Japan Aerospace Exploration Agency (JAXA) and National Institute of Information and Communications Technology (NICT) performed a verification of regenerative switching functions between an ultra small-size user terminal (45 cm-diameter antenna) and a high-speed small ground station (1.2 m-diameter antenna) using the onboard multi-beam antenna*1 of "KIZUNA," and confirmed that Internet protocol (IP) communications with a transmission speed of 155 Mbps (155 Mega bit per second) were successfully performed. The verification was a part of the initial functional verification jointly conducted by JAXA and NICT between March 28 and April 7, 2008. It is especially noteworthy that the transmission speed of 155 Mbps from a satellite to an ultra small-size user terminal like the antenna of 45 cm in diameter is the fastest in the world. KIZUNA's operations entered the initial functional verification phase on March 1, and the functions and performance of its onboard equipment are currently being verified. The functions that have been verified so far include the automatic tracking control of the multi-beam antenna and the output of approximately 280 W from the multi-port amplifier. 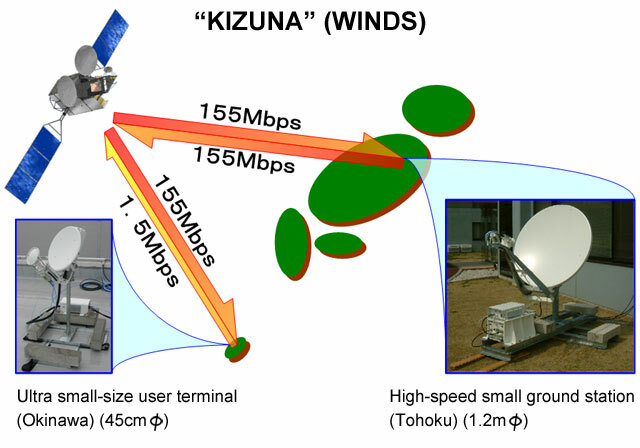 JAXA will further perform verification of KIZUNA's special features such as mutual connectivity across multiple ground stations, transmission at 1.2 Gbps (1.2 Giga bit per second), and the functionality of the active phased array antenna. An ultra small-size user terminal with a 45 cm-diameter antenna was placed in Okinawa and a high-speed small ground station with a 1.2 m-diameter antenna was placed in Tohoku. Data was sent from the 45 cm antenna to KIZUNA at a transmission speed of 1.5 Mbps, then sent from KIZUNA to the 1.2 m antenna at a speed of 155 Mbps. Data was also sent in reverse, from the 1.2 m antenna to KIZUNA at 155 Mbps and then from KIZUNA to the 45 cm antenna at 155 Mbps. Throughout these transmissions, KIZUNA was in the regenerative switching mode*2. KIZUNA is equipped with two multi-beam antennas, one for Japan and neighboring countries and another for the Asia-Pacific region. The former covers Japan (nine areas total), Seoul, Beijing, and Shanghai. The latter covers seven cities in the Asia-Pacific region. The regenerative switching mode is the mode in which data sent from a ground station to a satellite is demodulated in the satellite and sent to the destination ground station. The regenerative switch onboard the satellite is used for this process. Conventionally, data sent from a ground station had to be sent to another ground station to be processed and then sent from the satellite to the destination ground station. By equipping a regenerative switch similar to a ground station, communication can take place with less redirecting and therefore at greater speeds.